I have a very large rubber tree plant that I could not bring in my house this winter, because of its size, so I put it in the shed outside. 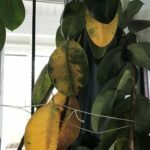 Due to some freezing temperatures, I believe my plant was frozen, and now I don't know what to do. Did I kill it or will it come back? Please advise me on what I need to do. Thank you.